The Japan Sake Brewers Association Junior Council, fearing that the pride of the Japanese people was in danger of being lost from Japan, formed the Sake Samurai last year as a gathering of those who share a love of sake and the desire to nurture it, to restore the pride of sake and to spread sake culture not only within Japan but throughout the world. Samurai: Those who are pure of heart, defending what is precious to them with passion and resolve. In ancient times, Japan was known as “the land of abundant reed plains and fresh ears of rice.” Water and rice. Indeed, these two elements are at the very heart of Japan. Nurtured over a long history in a beautiful land, Japanese sake made from such simple ingredients merges timeless wisdom with sophisticated craft. Yet this “national drink” is no longer an ordinary part of our everyday lives. Particularly in recent years, various changes in the social milieu have pushed sake, together with traditional foods and customs, toward the periphery of the Japanese lifestyle. We fear that the pride of the Japanese people is being lost from Japan. Meanwhile, Japanese food and sake have made remarkable inroads overseas, growing in estimation with each passing year. Japanese food and sake convey the beauty of Japanese culture to the world with the wisdom and knowledge of the Japanese people, and the world in turn has recognized Japan’s culture as an outstanding one. Today it seems it is the Japanese who have forgotten the pride of Japanese culture ? the pride of Japanese sake. The Japan Sake Brewers Association Junior Council is an organization of young sake brewers, heirs to Japan’s sake traditions, who have come together to learn from each other through friendly rivalry. As bearers of Japan’s sake culture, we must act now to revive the pride of Japanese sake now being lost. 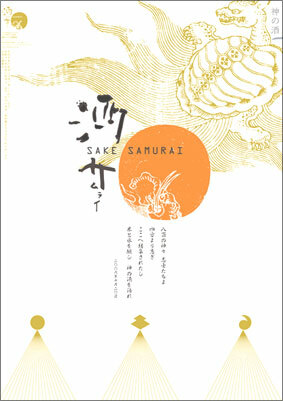 As “samurai” who love and protect sake, we are determined to spread the word about Japanese sake, a world-class culmination of Japanese culture and traditional craft, around the world. Pledging that those of like mind will broaden the circle of Sake Samurai worldwide, we hereby declare the formation of the Sake Samurai. ・Love both sake and the beautiful culture of Japan. ・Spread the word about Japanese sake around the world with pride and passion. and the magnificence of sake both in Japan and overseas. Our organization was originally founded in September 1955, as the Zenkoku Seishu Kyogikai (National Sake Council) to bring together the organizations of young brewers from around the country. Ever since then, we have been an active, energetic voice in the sake industry, taking a serious look at the various issues facing the industry, expressing our opinions frankly and issuing petitions and requests of related organizations as needed. Recently, aware of the need to make our presence more easily understood when undertaking various petitions and requests, we changed our name to the Japan Sake Brewers Association Junior Council on 1 October 1991. In addition, to scout talent from among the members of our own member organizations, we established various committees beginning in 1989. As part of our cooperation with the Japan Sake Brewers Association, we provide input and are involved in the planning and execution of various events and workshops. In addition, our members participate in the Japan Sake Brewers Association's board, council and various committees, where their opinions and input are taken into consideration. Members include brewer youth organizations from 42 prefectures , representing a total membership of 800 (of which 30 are women). Activities include stimulating demand for sake, holding events, conducting targeted research on the various issues that face sake, holding national sake tasting tournaments, exchanging information with various organizations, studying market changes in the alcoholic beverage industry, and cooperating with the Japan Sake Brewers Association. Copylight(C)2013 Japan Sake Brewers Association Junior Council All Rights Reserved.